Day Four was all about worms. Not my choice, but Jack's choice. He went to the library with Dad and came home with books about worms and informed me that we would doing worms next. 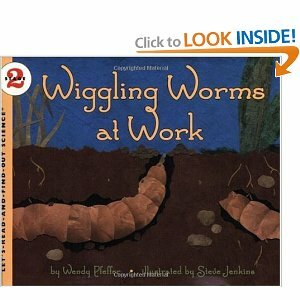 Learning Time - we started our day reading this great book Jack brought home from the library called "Wiggling Worms at Work." 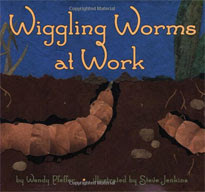 It was a wonderfully fun book that taught us both a lot about worms. Singing - We sang some cute worm songs to familiar tunes that I found here. Wiggle Worm - sung to "Did You Ever See a Lassie?" This Little Worm - sung to "This Old Man"
Hide from the robin, oh so big! More Learning - we recapped what we learned in the book and from a few other sources on our white board in the kitchen. Jack really thought it was interesting that worms do not have eyes AND that they eat dirt! Worksheets - Using printables I found online Jack colored a picture of an earth worm and then practiced writing WORM in print. Measuring Activity - We practiced using a tape measure to measure some gummy worms. Jack learned about inches and was able to measure a whole bowl of different length worms. It was hard for him to measure and not to eat! Worm Snack - We made worms in dirt snack bowl. Jack enjoyed crushing up the oreo cookies with a rolling pin and then hiding the gummy worms in the bowl of dirt. Outdoor Activity - Digging for worms! Jack had fun digging through the garden area for worms. He found a couple little ones and was very excited. I was excited that he did this on eon his own, digging for worms wasn't high on my list of fun things to do! We both learned new things about worms and enjoyed the day together!